What do you call someone who actively practices conservation? Not a conservative, obviously, that has an entirely different meaning in America. So I would imagine someone who conserves would be called a conserver. Only conserver isn’t a recognized word, according to my auto correct. 1. To protect (something, especially an environmentally or culturally important place or thing) from harm or destruction. …So, why is there no recognized word for someone who actively conserves materials to protect something from harm of destruction? Is it that abstract a concept? Of course we have “conservationist,” but to me, that is a very broad umbrella term and usually is designated to protecting the world outside, wildlife, the environment. 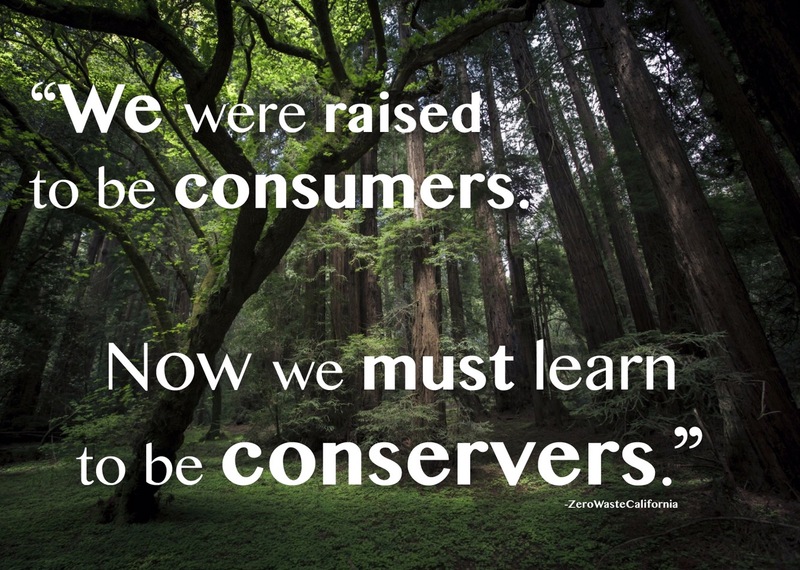 What about conserving within our household and community to protect the larger scale environment? Community conservationism. This would be the polar opposite of “commercial consumerism,” which is an addiction many of us still suffer from. In order to really understand how we have evolved to become consumers, we must first realize that we have been essentially brainwashed since childhood to believe that we need possessions in order to be happy and that success is measured by income. And to understand that, we must go back in time. We could go all the way back to the Industrial Revolution, when convenience items became available and affordable to the working class. But let’s skip to the end of WWII, when the exhausting amount of chain factories designed to mass produce jets, bombs, and other items for war, needed to innovate their products for peacetime in order to stay in business now that the war was over. Now remember, WWII was terrible ordeal and people globally were forced to ration foods like meat, butter, sugar, bread and things we consider staple items. Fresh produce was almost completely unavailable unless you grew it yourself. Many materials like nylon were banned from stores all together, as they were needed for the war effort. So once the war ended and these items became available again, people were understandably very excited to purchase these previously forbidden sundries. With advancing technology, mass manufacturing availability, and soldiers returning from war looking for work, appliances were being created and sold at an exponential rate. Then babies started booming. Radios became a household item and companies found a new medium to advertise their products. Who can forget how upset Ralphy gets in A Christmas Story after decoding the first message with his long-awaited Little Orphan Annie Secret decoder pin, only to find out its a crumby ad to drink more Ovaltine. My parents were born, and their generation was the most consumer driven generation in the history of the world. My grandfather worked for General Electric in Massachusetts and my father had one of the first microwaves ever manufactured. Convenience became the norm. 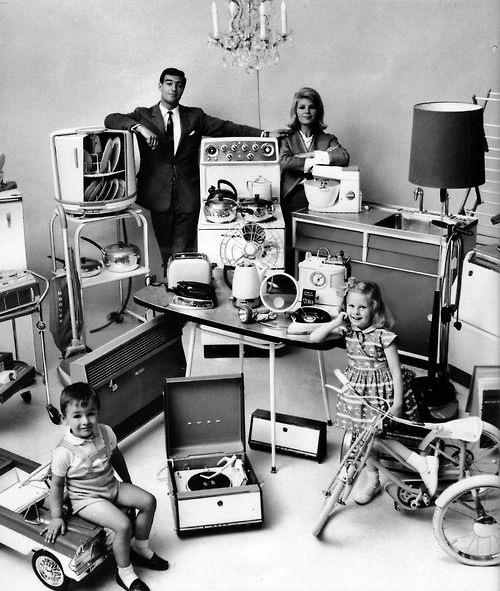 Appliances like dishwashers, microwaves, vacuums became commercially available and affordable. The motto of Keeping up with the Jones’s was coined. In the 1940’s, De Beers placed an ad stating engagement rings should only be diamonds, and should cost the male suitor one month’s salary. In fact, before WWII, the concept of an engagement ring didn’t even exist! Then De Beers monopolized the entire diamond industry and controlled the market. This is just one of many examples of customs we consider to be “normal” because of consumerism and really good marketing. By the 1950’s, a large middle class was created and still growing. Mass consumerism not only became socially acceptable, it was considered necessary in order to feel like you were staying current with the growing trends. The economy grew by almost 40%, and by the end of the decade, the average American family had 30% more spending power. Then the first credit card was born. Now a person could buy items with money they don’t even have! A large privatized debt began to grow on a national level. But with unemployment records low and income high, spending quickly became an obsessive addiction. And with all these new inventions and purchases being manufactured, new forms of packaging were invented to contain the product, and often ship it elsewhere. Meanwhile in stores, packaging was now a powerful commercial tool to draw attention to the product and help advertise it. Although synthetic plastic (plastic derived from fossil fuels) has been around since the turn of the 20th century, the production of it didn’t accelerate until the 1930’s with the invention of polystyrene (styrofoam), nylon, polyester, and polyvinylchloride (PVC). These plastic products were mass manufactured by petrochemical companies using massive amounts of crude oil, a non-renewable fossil fuel. Then I discovered something shocking. During WWII, the same petrochemical companies gained major success by implementing plastic in almost every aspect of the war effort. From tanks to weapons to communication devices, crude oil was being extracted on a unimaginable scale and processed into plastic. Then the war ended, and military production came to a halt. Petrochemical companies desperately innovated new ways to market and sell plastic to the average American. A year after V-E Day, Tupperware was invented. 4 years after that, the trash bag was a household item. Then came the plastic grocery bag, the sandwich bag, and soon plastic bags for all your storage and convenience needs. Of course, lets not forget plastic cutlery, dishware, straws and tooth brushes. We were eating off substances we knew very little about, drinking from them, as a kid I remember chewing on black stir straws until they were almost white. And then came the single use plastic water bottle. “Every year, 63,000,000,000 gallons of oil are used every year just to supply the U.S. with water bottles” (A Plastic Ocean). We’re only starting to understand how harmful BPA is. What about the other plastics? What makes them safer? How do we know they aren’t endocrine disruptors as well? More and more crude oil was being extracted globally to support our consumer habits, our need to travel, and our need for convenience products. But it wasn’t just limited to fossil fuels. We began extracting all our natural resources more rapidly than they could ever be replenished by nature. When oil supplies ran out at one location, new locations were scouted and drilled. When those reserves dried up, they resorted to fracking and other environmentally hazardous methods to extract oil. We cut down forests. We mined for coal, metal, stones and other precious elements. We mined for noxious gasses, toxins, and radioactive materials that should have been left deep beneath the earth. Our resources are finite. We must immediately transition to renewable sources for energy. We must conserve the non-renewable resources we have already extracted. And we must preserve the materials remaining in the Earth. We’ve used up almost all our natural resources on our planet. Including drinkable water. Unless we change our habits on a global scale, right now, we will exhaust the most of our natural resources in our lifetime. But we only have 3 years. Next Post: Why Zero Waste?